Hard copies available On this page, I offer hard copies of some of my publications that are out of print or for other reasons may be difficult to find. Obviously this concerns monographs (books and working papers) rather than papers published in journals or collections, although a limited number of reprints of journal papers or book chapters are also available. No commercial purpose is involved; the idea is to enable those interested to get hold of some of my writings that are now difficult to obtain. Cost Prices for the publications as well as for shipping them to different destinations are listed at the bottom of this page. All charges are indicated in Swiss Francs (CHF) and payment will equally be required in CHF. Except for simple reprints, registered mail is recommended for all destinations outside Switzerland and is required for overseas destinations. How to Order If you are interested in any of the hard copies offered, please email me through the link provided with each offer (on the bottom left of each article description) or through the "Contact" page of this web site, and give me the details. I will then get back to you, usually within 1-3 days. Description The Primer offers a practical introduction to the use of Critical Systems Heuristics (CSH) in social planning or social systems design, understood in terms of action research. Probably one of the more easily accessible introductions to CSH. 5.2. 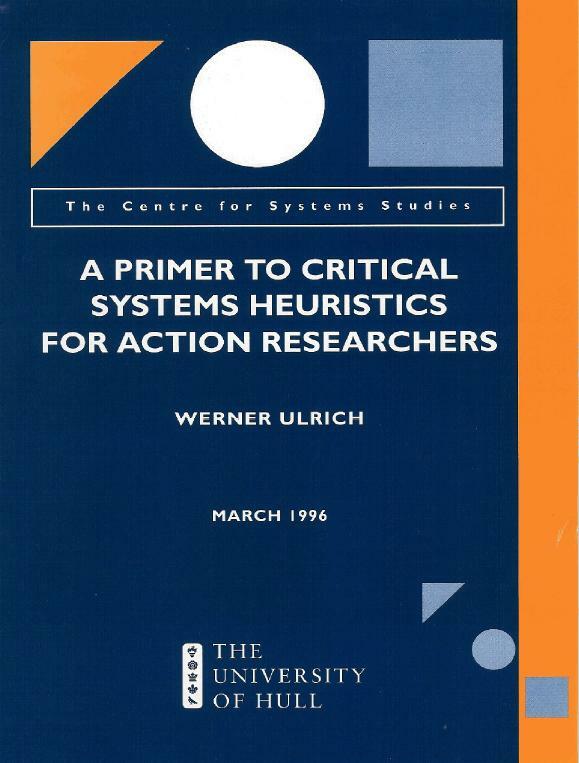 Is Critical Systems Heuristics Too 'Intellectual'? 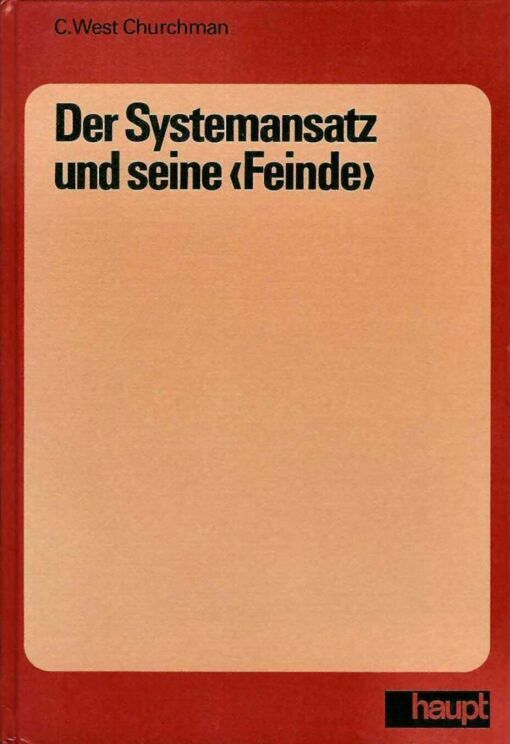 Description This is my German translation of West Churchman's book, The Systems Approach and Its Enemies (New York: Basic Books, 1979). It comes as a commented translation, with a substantial introduction by the translator. When the publisher decided to discontinue the book, I was offered the remaining stock at a reduced price and am therefore able now to offer the book with a discount of almost 50% (at CHF 42 instead of the original price of CHF 78). Its condition is new and unused; it comes unopened in the original, sealed, plastic wrapping. 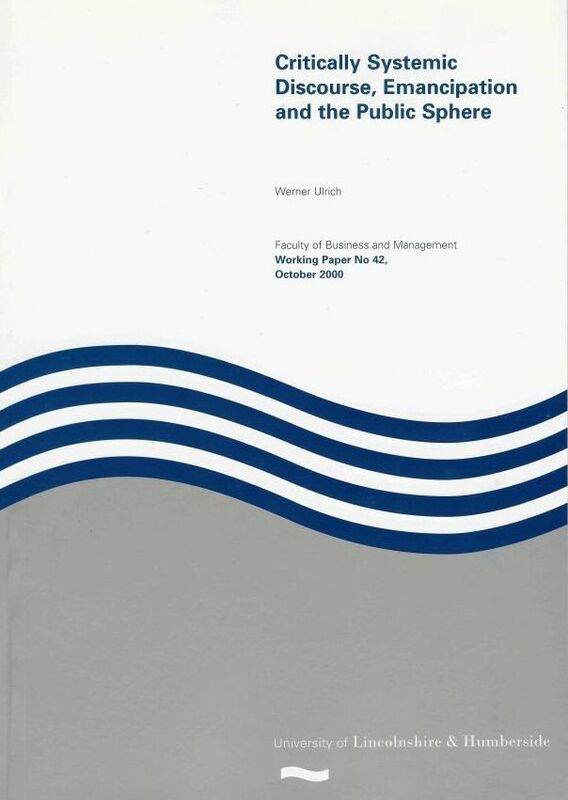 Cover text (extract) [in German language] "Der Systembegriff wurde von der herrschenden empirisch-analytischen Wissenschaftsauffassung, die sich am naturwissenschaftlichen Modell orientiert, zu einem Intrument bloss instrumenteller Vernunft gemacht, die seinem ursprünglichen philosophischen und kritischen Sinn widerspricht. Churchman stellt dieser szientistischen Verwendung des Systembegriffs seinen 'dialektischen' Systemansatz gegenüber, der seine eigene Begrenztheit reflektiert und überwindet, indem er sich jenen Standpunkten gegenüber öffnet, die seinen Anspruch auf Systemrationalität in Frage stellen: der politische Standpunkt, der moralische, der religiöse, der ästhetische. Indem er den Systemansatz dialektisch als Ansatz zur Entfaltung des unvermeidlichen Konflikts zwischen dem Systemplaner (der vorab die Gesamtrationalität seiner Pläne im Auge hat) und den 'Feinden' solcher Rationalität (die ihre je eigene 'private' politische, moralische etc. Rationalität suchen) begreift, liefert Churchman einen Beitrag zur neubelebten Grundsatzdiskussion um die Möglichkeit und Bedeutung praktischer Rationalität im Sinne Kants." Description This Working Paper originated in a seminar with research students of the Lincoln School of Management on the topic of how we can develop competence in (systems) research. The seminar was held to guide participants towards reflection on their personal notion of competence, both in research and professional practice. The current version was written in order to offer further help to doctoral students in formulating or advancing their dissertation project, or to practitioners who wish to clarify their notion of professional competence. A considerably expanded and reworked version was later published as "The quest for competence in systemic research and practice" in Systems Research and Behavioral Science, Vol. 18, No. 1 (2001), pp. 3-28. The original Working Paper may still be of interest, though, due to its brief and easily accessible format. (1) An adequate practical conception of critical systems thinking today needs to be based on a discursive theory of critique rather than a framework of critical methodology choice. (2) A discursive systems approach cannot be adequately conceived without considering the role of the public sphere. (3) The much-discussed emancipatory orientation of critical systems thinking inheres in the methodological requirements of rational discourse rather than in a personal act of faith (an emancipatory commitment) on the part of the systems practitioner. (4) Contrary to present conceptions of methodological pluralism or 'complementarism', the importance of the emancipatory orientation cannot be restricted to a subclass of problem situations and corresponding methodologies, for the emancipatory orientation is constitutive of all critical inquiry and practice. These critical considerations lead to a redefinition of critical systems thinking, and to a new view of reflective professional practice in general, as critically systemic discourse. Extract from the Introduction "In Critical Heuristics (Ulrich, 1983) and on other occasions (e.g. 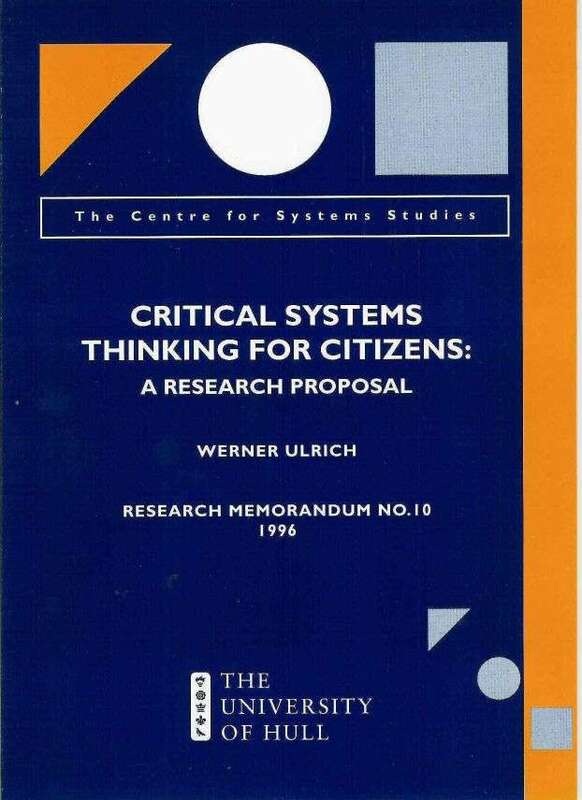 Ulrich, 1988a), I have argued in detail why a shift from the conventional ‘mono­logical’ to a dialogical or discursive (communication-theoretic, language-analytic) understanding of the systems approach was indispensable for critical inquiry and practice. This shift was inspired, in different ways, by the dialectical systems approach of C. West Churchman (1979; cf. Ulrich, 1999) and by the linguistic and communication-theoretic turn of both contemporary practical philosophy and critical social theory, particularly as represented by the theory of communicative action of Jürgen Habermas (1984, 1987). While this shift of perspective has gained support in recent years, I have the impression that its implications are not always properly understood. They concern particularly the meaning of discourse and the methodological intent of the underpinning emancipatory interest. In order to clarify these two concepts, I propose that we take present conceptions of critical systems thinking (CST) one decisive step further, towards a truly discursive understanding of CST as critically systemic discourse (Section 1.1). Description This Working Paper offers a revised version of a talk that was given to the staff and the Ph.D. students of the Lincoln School of Management on January 16, 1997. 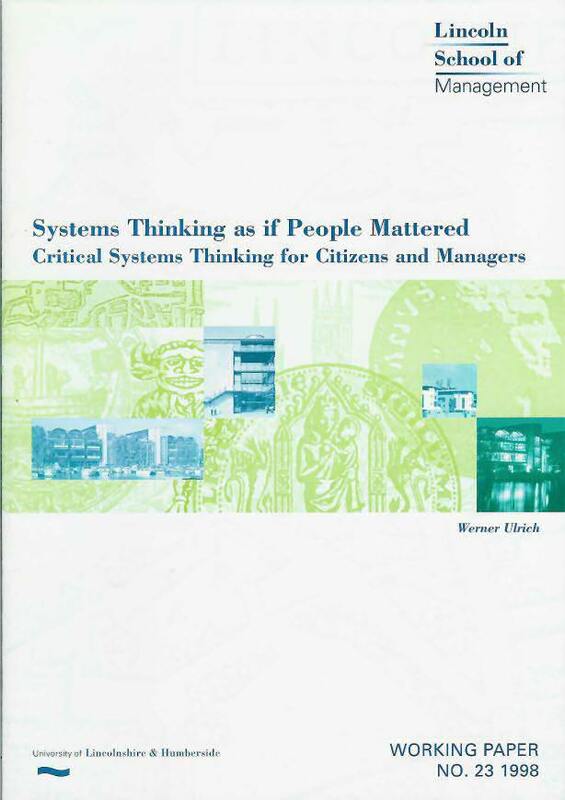 The author's research program, "Critical systems thinking for citizens," is explained and discussed with special regard to its goal of contributing to the revival of civil society. It is argued that critical systems thinking has the potential of giving citizens a new sense of competence, and that this new competence will also alter our notion of competent management. Description If Critical Systems Thinking is to contribute to enlightened societal practice, e.g. with respect to the pressing environmental and societal issues of our time, it should be accessible not only to well-trained decision-takers and academics but also to a majority of citizens. The point is not that Critical Systems Thinking ought to take an advocacy stance but rather, that it has a potential to give new meaning to the concept of citizenship; it might enable all of us to become more responsible citizens. My question is, how can we harvest this potential? I propose that the way in which we seek to answer this question might constitute an important test for the methodological viability and validity of Critical Systems Thinking. Extract from the Introduction "When I set out to write Critical Heuristics (Ulrich, 1983) it was 1976. 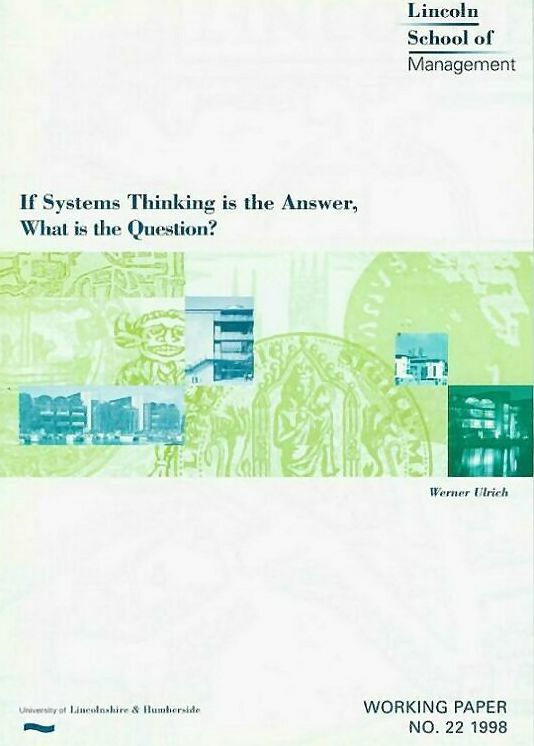 There was far and wide no such thing as 'Critical Systems Thinking' (CST) – in fact not even the major contributions to soft systems thinking by Churchman (1979), Ackoff (1981) and Checkland (1981) had been published. The same holds true for the major work of contemporary Critical Theory, Habermas' (1984) Theory of Communicative Action. It was necessary to begin from scratch and to work out some fundamental philosophical and methodological ideas for what I then envisioned to become a 'critical systems approach'. It was a far way to go. It was not a primary necessity at that time to think of didactic issues, so I didn't. Philosophy for professionals: towards critical pragmatism. Journal of the Operational Research Society, 58, No. 8 (Aug.), 2007, pp. 1109-1113. [ISSN 0160-5682] Also available on-line at http://www.palgrave-journals.com/jors/journal/v58/n8/ (restricted access). Reply to the comments of Ormerod: the history of ideas of CST. Journal of the Operational Research Society, 55, No. 11 (Nov.), 2004, pp. 1238-1241. The quest for competence in systemic research and practice. Systems Research and Behavioral Science, 18, No. 1, 2001, pp. 3-28. [ISSN 1092-7026 print, ISSN 1099-1743 on-line] Also available on-line at http://www3.interscience.wiley.com/cgi-bin/jissue/76509522. Reflective practice in the civil society: the contribution of critically systemic thinking. Reflective Practice, 1, No. 2, 2000, pp. 247-268. [ISSN 1462-3943 print, ISSN 1470-1103 on-line] Also available on-line at http://taylorandfrancis.metapress.com/ (original layout file) or at http://wulrich.com/downloads.html (prepublication version). Testament to conversations on critical systems thinking between two systems practitioners. (With R.L. Flood). Systems Practice, 3, No. 1, 1990, pp. 7-29. Other papers Many papers listed in the list of publications but not here can be downloaded as PFD files from the "Download" page of this site. In cases where neither a PDF file nor an original hard copy is available, photocopies can be made available upon special request. postage will depend on total weight. Make your payment with PayPal – it's fast, free, and secure!